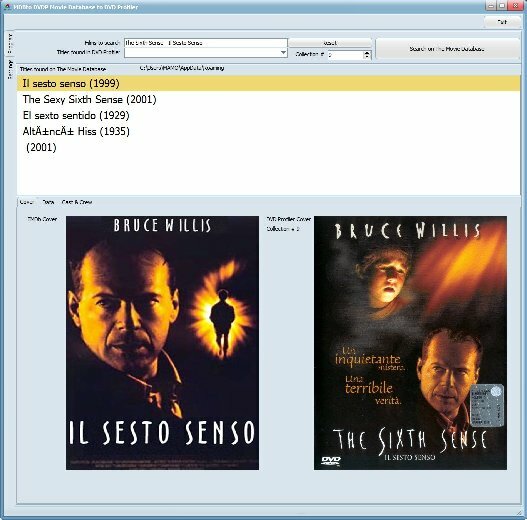 I published a program that allows you to retrieve information from the database TMDb (The Movie Database). In this way we can complete those profiles that are not yet complete. 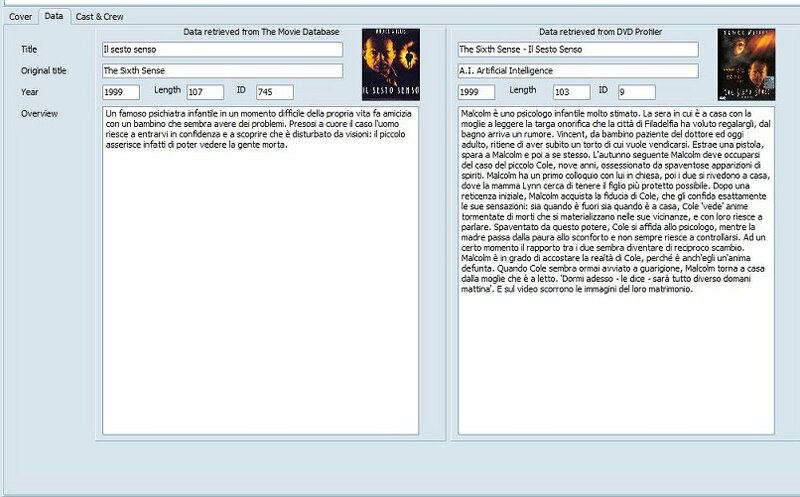 The program allows you to find and download covers, movie data, cast & crew. The program is completely freeware. ... never mind (was going to report a problem...) but I apparently missed something with the configuration. I'll comment on my experiences later on. Thanks for sharing your software! EDIT: I managed to get my TMDB key, but when I enter it in the program, I get error message "Unable to write to C:\Program Files (x86)\Ciemmesoft\MDBtoDVDP\MDBtoDVDP.INI". No matter what I select as my paths for "Database backup archive DVDProfiler" or "Database location DVDProfiler" on the settings tab. There is no .INI-file on that location. The search for any movie title therefore doesn't work now. Well, if there is any Invelos staff still around, this tool will certainly get their attention. Will be interesting to see what, if anything, will be the response. The last post I found from Ken Cole is from September 2017, so this seems to be a wayward ship, still floating and passengers alive, but crew looong gone. I wouldn't expect any reaction from the Invelos staff. Maybe they are keeping busy with something more worth their while. Why would Invelos react to this? 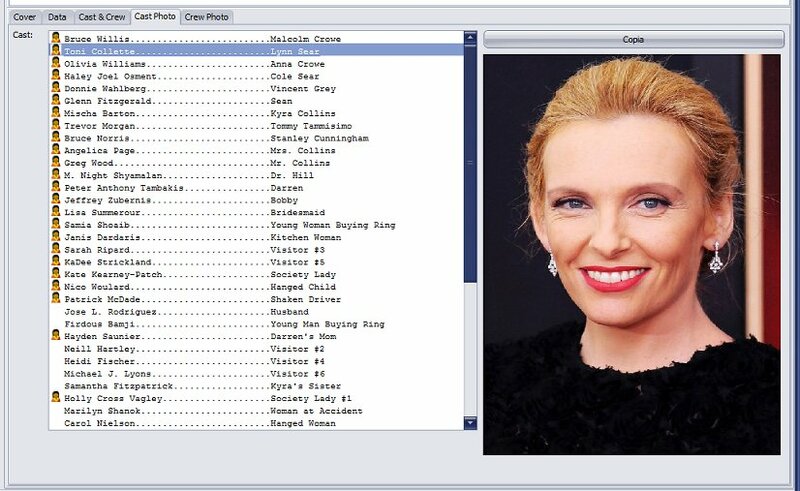 DJ Doena's CastCrewEdit had done the same from IMDb for years without any reaction. Hi Draxen and thank you for trying to use the program. Sorry but the program is in the early stages of development and I could only test on a few PCs. Probably in your PC configuration you did not give the possibility to write in the program folder. This is a windows security system. On the PC where I tested the program, instead, you could write. I have published a new version of the program that writes the configuration file to another location and therefore the problem you reported should be bypassed. They may have some complaints, but my program uses tools made available by them. In their program there is the function of "pasting" the data. I challenge anyone to manually create the XML file needed to paste the data. Therefore if they have inserted this possibility, they have foreseen that someone used it generating automatically the data. 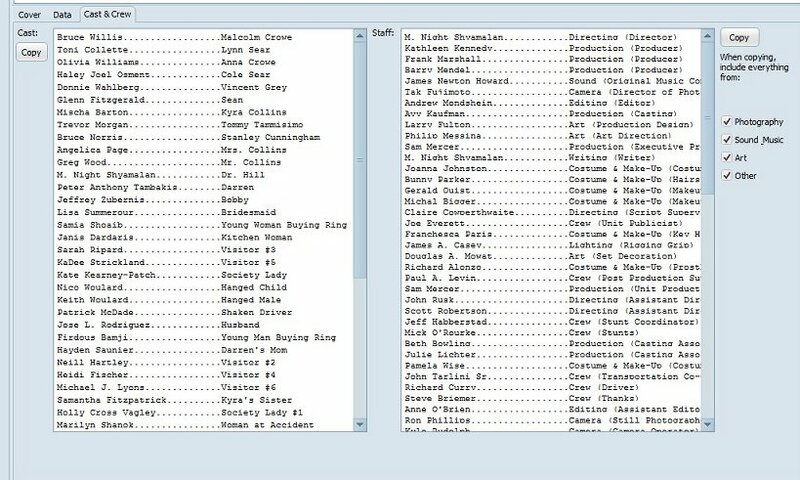 My program generate this data (in a format compatible with their program) by taking them from another site (in my case TMDb, while in the case of CastCrewEdit from the Imdb site). That's more along what I meant. I was curious if that rule is still is being "enforced" or whether anybody cares. I for one, do not. Oh, and Mamo, please do not for a moment interpret my question as a criticism of your good work. ...I have published a new version of the program that writes the configuration file to another location and therefore the problem you reported should be bypassed. Thank You! I am right now in the middle of something else, but I will of course try with the new version as well in better time, and will then let you know how things went. Oh, and Mamo, please do not for a moment interpret my question as a criticism of your good work. Do not worry, I understood that your concern was on the possible reaction of Invelos. Well, let's consider my program as a provocation. If they react, it will mean that they still follow their product. Some time ago I had reported a serious bug with their application for android (data loss). The bug is easily solved (just delete the change cache after synchronization). I did not have any reaction about it. I interpreted it as a bad sign. Cool. Exactly. We are on the same page. I like the idea, but there are some problems. - I can't believe that TMDB really requires every end-user to have their own API key. - Why does the program require that the exported collection is named Collection.xml? - The Settings uses a file browser to browse for the database directory. That's confusing. - "Move the screen all the way to the left". That seems an odd setting. Why not just save the window position? - "Automatically copy the data". Copy when? Copy what data? - It picks up the wrong data from my collection. The ID (996) is correct for Clash of the Titans, but the rest of the data is wrong. - It doesn't handle bold and italic in the overview. "We currently rate limit requests to 40 requests every 10 seconds. You can inspect the status of your limits by looking at the X-RateLimit response headers." Simply because it is the default name of DVDProfiler (at least in my case). I believe there are no problems with using another name. Unfortunately if I use simpler system dialogs, the compiler behaves strangely (there is probably a bug in my program but I could not find it). In the next versions I will put the rescue of the last position. You're right, it may seem strange, but it was born from my need. By having a monitor 21: 9, this way I work alongside my program (left) and DVDProfiler. 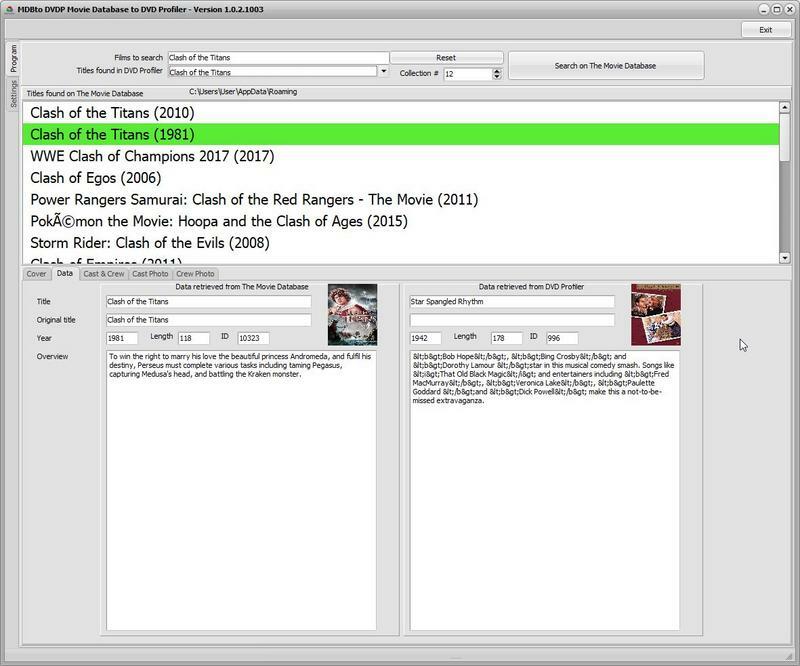 In the screen containing the film data downloaded from TMDb, if this option is set, if you click (just a simple left click is enough ) on the various text boxes, the data contained in it is automatically copied to the clipboard. It is useful for pasting in DVDProfiler. It appears that the program did not correctly import the collection. Can I take advantage of your courtesy and ask you to give me a hand to understand the problem? The program transforms the XML file generated by DVDProfiler into a more readable file. If you use a text editor that also marks the line number (I use ntepad ++), can you check if the line number matches the first data in the text line?